Biking near Stanley Park, I stopped for a break and took a few shots of the beach on the south side of downtown. Surlac leans to on the metal contraption, or artwork, or whatever it may be called. After this I grabbed some noodles, home made and totally awesome. 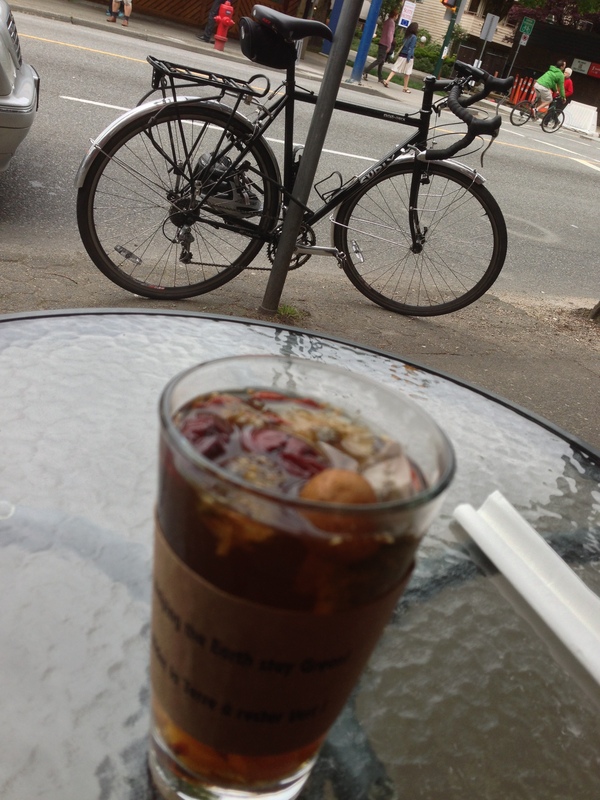 While there I also had a tea while sitting outside, Surlac in the distance. Next up I rode up on the Brurrard Bridge and got a shot of the shipping in the waterway. Overlooking the shipping in the bay. A little further along I found a giant bird!! Stopping on the Viaduct to get some pictures. 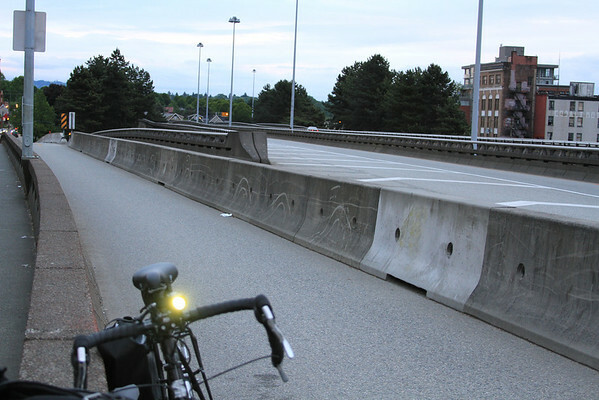 On the Viaduct, in the protected bikeway. note, I am in the bikeway, where I’ve stopped and have set my bike in the picture. I’m stepping over into the pedestrian sidewalk on the bridge, and the cars go way over there beyond the concrete barriers. A TRULY separated bikeway. Vancouver might not have the bike culture in Portland, but it absolutely is working toward being as world class as Amsterdam is! It’s truly impressive what they’ve done in a mere 2-3 years! 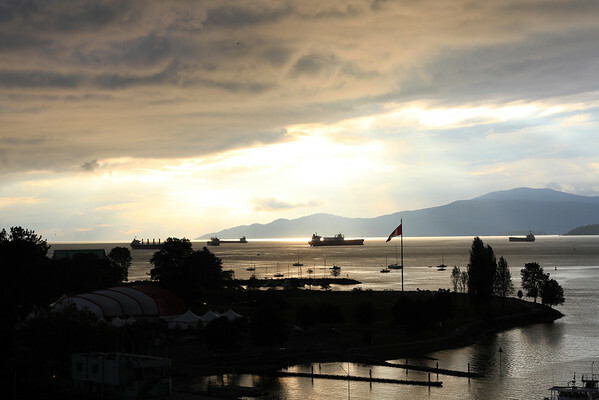 Vancouver is one of my favorite cities to visit in North America hands down. Looking into the city from my first stop on the Viaduct I took a few shots, here’s one of the one’s that turned out pretty good. Completely unedited. 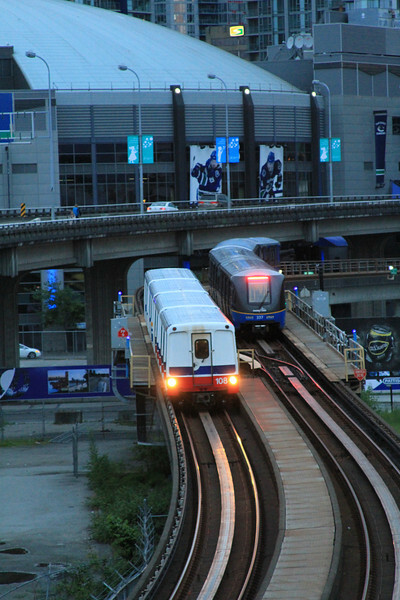 Translink Skytrain heading into downtown. 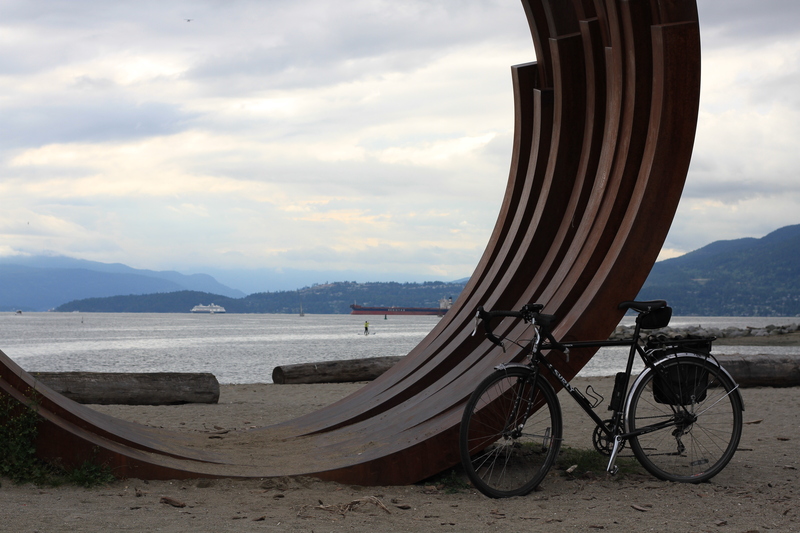 …and looking the complete other way I saw two cyclists riding up with the Skytrain heading toward us in the background. 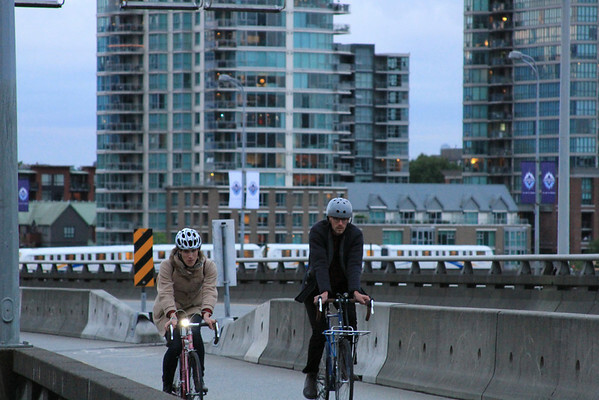 Skytrain & Cyclists on the Viaduct. 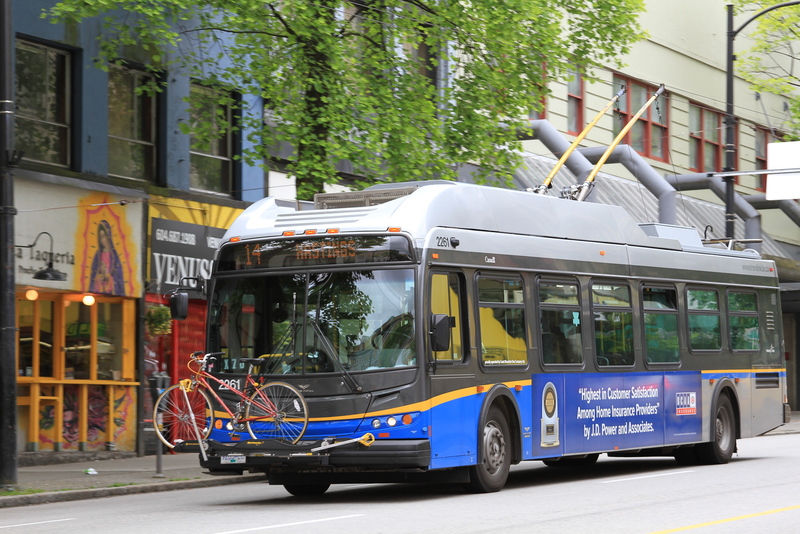 Last but not least, one of the venerable trolley buses of Translink. 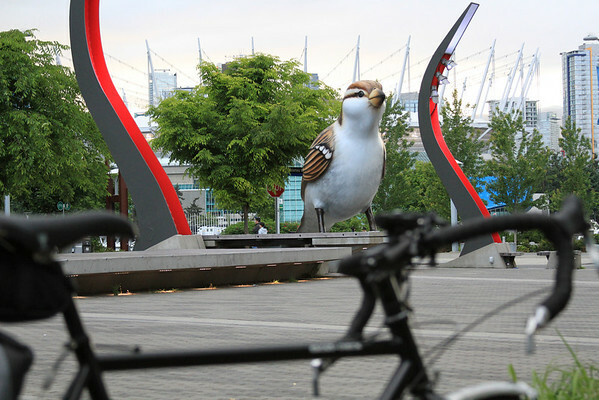 For more of the images from this collection check out “I Bike About” and “Monday in Vancouver“. That’s my tour for now. Enjoy! Nice shots – love the sculpture… or whatever. Nothing better than artwork and a bike. Rad! We just got home from BC yesterday, regrettably didn’t get to explore the skytrain as much as I would have liked, but it was a good time despite the rain. The bikeways were nice to see, especially in stanley park. I would love to see something similar in waterfront park/eastbank esplanade next time it needs redoing.